In the world today, females are coming to the same level as males especially in the professional world. In the field of engineering at the moment there are very few female engineers present. These women know that they have a number of huge responsibilities on them and so have taken this job of an engineer. So there are just a few selected women who are practicing this field of engineering. Why Aren’t many Female Engineers Present? Just finding a few handful women in this field, certain questions pops up in people’s mind. People start thinking whether or not female engineers are fit or competent enough for carrying the role? They also begin thinking whether there are few additional issues needed to be dealt with in the workplace. While looking for engineering students it is greatly seen that the students getting the highest marks in science group are mainly the female students. But why do they back out when it comes to taking the actual job of an engineer? There are certain ways by which an individual can attract female engineers and hire them to work for their company. The ways have been mentioned below. The initial journey of the engineering job for a female student begins from the college itself where they do their engineering studies. So at this time, a number of girl students form their own separate groups to help each other. But at times lack of support and a negative influence may entirely remove the concept of working as an engineer in the minds of the student. So from the initial moment itself, the person needs to start supporting the engineering student groups in the college. By supporting these groups, the students may feel that they are wanted and they can consider working for them in the future. If the company wishes to have more female engineers in the workplace then they need to solely concentrate on hiring only female engineers in their next recruitment program. The recruiter should first recognize that female engineers tend to be better than make engineers. Certain female engineers can do or carry out certain tasks which male engineers cannot. So simply concentrating on only hiring female employees will get the recruiter the person they desire for the job. Hazing also known as ragging is a set of activities which a person does to someone else which is harassing, any kind of abuse or humiliation in the workplace. Before the female engineer thinks of practicing or accepting any kind of future job, they begin to think that they will have to go through similar problems. So during the interview itself, the recruiter should inform them that this kind of behavior will not be tolerated in the workplace. Also inform them that if such a thing happens then they can report and take any necessary actions. Having respect in the workplace between each and every employee is really important. Workplace respect will properly define what the company is in reality. Such a behavior will only keep on attracting engineers and in this case, female engineers to the company. Hence when the interview is going on, it is important that the interviewer lets the female engineer candidate know that they mainly emphasize on maintaining proper respect in the workplace. Sexism happening in the workplace is common in every company or office today. Women everywhere still suffer from work place sexism in the form of any discrimination between the men and women, using certain offensive statements against women, inappropriate actions towards women, etc. Just because the person working in the company is a woman it doesn’t mean that they can be treated in any way. Similarly before hiring female engineers the recruiters need to assure them that they do not prompt sexism in their workplace. They can also file a complaint with the company’s HR if anyone behaves inappropriately towards them. Initially itself, the female students may not have a role model in their life. The female engineering students may only feel that becoming an engineer, they may have a satisfactory family life. This won’t prompt them in further doing the engineering job actually in their real life. So before recruiting the female students who may be still in their first or second year, they need to have a certain person to act as a role model in their life. Discuss with them people who achieved similar achievements in their life either well have known public personalities or ordinary employees in any workplace. A person who thinks that they are incompetent has lost self confidence in them. They think that they have lost any of the abilities they once possessed or do not have any knowledge or skill required for carrying out a task successfully. Female engineers normally think that though they are engineers now, they still have low self esteem within them. So the person hiring needs to remove the feeling of incompetency within them and further encourage them to accept the job which is being offered to them. The greatest happiness for any woman in the world is the feeling of motherhood. Before joining the engineering company, the woman also thinks what will be the reaction in the workplace once they announce that they are pregnant. They begin thinking that things may begin to get complicated in the workplace. So even before hiring the woman, the person can assure them that they won’t have any inconveniences towards them personally as well as the workplace. Even tell them that they will be provided an appropriate maternity leave at this time. The first impression itself that a person receives about a company is how the behavior of the people who represent the company is. If a female candidate is needed to be attracted into a particular company, then the representatives need to keep maintaining a professional behavior at all times. This behavior should first be carried and maintained throughout the interview. They should next emphasize that they focus on always having and maintaining a professional behavior with everyone in the workplace. Any person would like to have a flexible work environment so that they have less number of inconveniences. A flexible workplace will provide a flexible number of work timings which will really be beneficial for the future potential female engineers. Hence during the actual interview itself, the recruiter needs to mention that the workplace is a really flexible environment to work in. A flexible work environment will further prompt the person to select the company for working. Their daily work timings as well as overtime timings can be efficiently managed by them. Motivation is one of the most important things that a person needs to have within them so that they can begin with a new journey in their life. The life of a female engineer student is similar before they think of beginning a new journey on completion of their engineering studies. So before and during the interview, the person needs to motivate the candidates to how they are wanted in the workplace. This gives them a sense of belonging that they are needed and hence they may select to begin working as an engineer. If the recruiter really wants the female engineer to work for them in the future then they need to know that they can feel safe at all times in the workplace. This mainly refers to the elimination of any gender discrimination in the workplace. If the male workers are given a bigger priority than female engineers then no female would want to work in such a workplace. So assure them that the overall environment in the workplace is comfortable. Also tell them that every individual is given an equal importance irrespective to the gender they belong. Having a mentor in life really transforms the life of any individual. Certain candidates or students do not have such a person in their life while they are practicing their studies. Hence even after they complete it, they will not consider in taking that next step further and actually accepting a job with an engineering company. So for that colleges at times organize mentor programs. So at this moment, the potential future recruiter needs to be a part of such programs so that they can identify if there is a future candidate who can be perfect for them. Female societies are the different organizations which mainly work for the benefit and welfare of different women present. At least one such society is present in a college which will assist a female in any problem. With the help of such societies, the recruiters should also approach the female engineers for any jobs in their company. This will help the company in getting the desired candidate which fits the entire job profile being offered. There are a very few number of female engineers which are present in the world today. All of them should be given due importance for the work they have contributed so far. Whenever any person comes across a female engineer they will have to talk to them with interest and show them that they are important. If they don’t, then even other future female engineers will begin to think that women are neglected. This won’t influence them to choose the career of a female engineer in the future. So always give any female engineer due importance at all times. When a recruiter has built a strong and effective internship program then the undergraduate female candidates can become a part of the organization. If the internship is a paid type then female engineers will apply for it. These programs can also provide an individual mentor for every female candidate who joins the program. This will help in creating a personal connectivity between the female candidates as well as the company and the university where the students are from. Once the program has been concluded and if they liked it, they can consider joining the same company in the future when they become engineers. 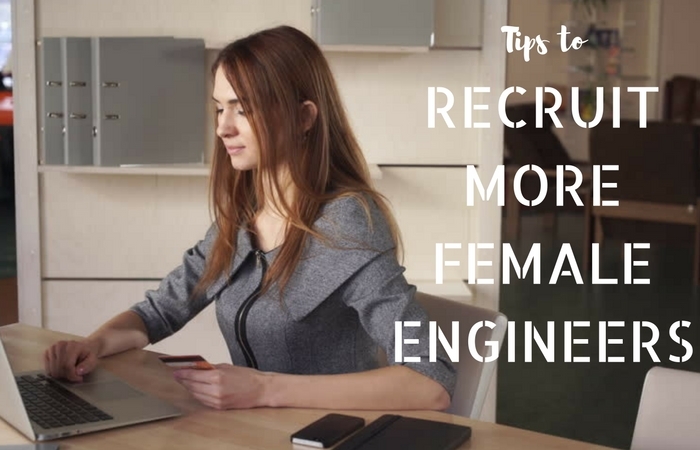 The recruitment procedure for hiring and attracting number of future potential female engineers begins from the colleges and universities itself. These places keep a track and record of which of their students are brighter in which field and what will be preferred by them. So it is important that the recruiter takes assistance from the college or universities for hiring the candidates they prefer. This will help in saving their time and it will also provide the information for the right type of person who fits the job perfectly. Working from home is one of the newest and the most influential kinds of job which is dominating the world today. Working from home helps in saving time and provides the person with the entire information regarding someone who may fit the job profile in the future. So using the option of work from home, the recruiter can use it as a means of attracting potential female engineers for their company. This can happen in a large number at one time and the interested candidates can be hired by the company. This ever dynamic world is showing that females are becoming much better in education than males. Hence female engineers should be considered to have in the company.